Couture Cases can be fantastic radiator covers, or simply decorative wall furniture and lighting. Constructed in a powder coated steel frame, each YOYO Galvanised design is available in a wonderful, industrial look, lacquered sparkle finish. With an unlimited range of size configurations, this YOYO Galvanised case is built to last, and will suit a huge range of interior designs. Should you require a colour or finish that is not shown please contact us as part of our bespoke design service. If that wasnt enough, you can also select from a range of eyelet styles and patterns, and whether you wish to incorporate multicolor LED lighting for the extra WOW factor. 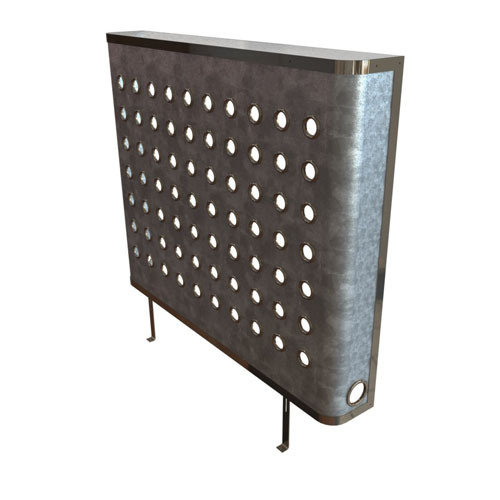 YOYO Galvanised radiator covers are the showstoppers in the YOYO range. Manufactured in a high quality stainless steel frame, and sparkle finish galvanised steel, you can now create a real talking point for any room. Fully height adjustable to match your skirting board height and assembled in minutes, this design range needs no painting or finishing and the metal finish is wonderful to behold. Each top is available in coloured or natural toughened glass or mirror glass to match your decor.